What does someone do with 30 years worth of photography from the sharkiest place on Earth? They put together a 340-page guidebook. That’s just what Undersea Hunter Group’s Avi Klapfer has done with his spectacular photo archive from Cocos Island, Costa Rica – the UNESCO World Heritage Site and top scuba dive destination on the planet. 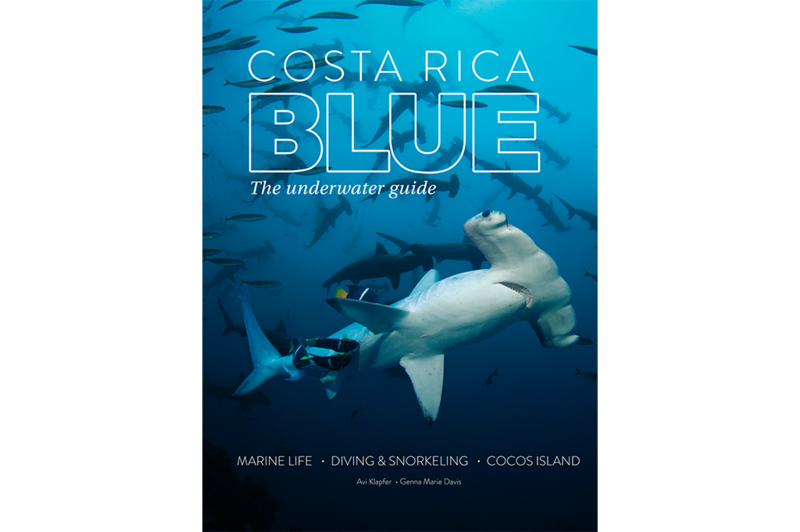 Costa Rica Blue: the underwater guide to marine life, scuba diving/snorkeling & Cocos Island covers all of Costa Rica, from coast to coast, with a heavy focus on the crème de la crème that is Cocos Island. The book’s first section features fact sheets and infographics highlighting the country’s most fascinating sharks, rays, sea turtles, whales and dolphins, fish and invertebrates. Then it sums up the diving and snorkeling hotspots in both the Pacific Ocean and the Caribbean, with colorful maps and practical advice. Last but not least, over 100 pages packed with beautiful imagery commemorate the wild and alluring island that is Cocos – just in time for its 40th anniversary as a national park on June 22, 2018. Long before the invention of recreational scuba diving, for centuries Cocos has been a magnet for naturalists, adventurers, pirates and treasure seekers alike.Through spectacular images and original newspaper articles dating back to the 1800s, readers can discover Cocos’ marine and terrestrial biome, its dozens of dive sites and its mysterious history peppered with pirate lore and buried treasure. Costa Rica Blue is a collaborative effort written and compiled by Genna Marie Davis over the course of 2.5 years. Backed by interviews with countless scientists, conservationists and expert divers in the field, the work is the most comprehensive volume of its kind. In addition to Avi Klapfer, a dozen other local photographers also contributed images – most notably Shmulik Blum, Sean Davis and Diego Mejias. The book will be available for sale at Cafe Britt retail stores and local dive shops, and for direct purchase on the website www.costaricablue.org or on Amazon.. Copies purchased through the website will receive a free bookmark and can be shipped to the USA, Germany and the UK as well as within Costa Rica (via Correos de Costa Rica or encomienda by bus).